From the kitchen of One Perfect Bite...I'm not given to hero worship and will never understand the commotion that surrounds some icons in the cooking world. I have respect for the very best of them and an amused tolerance for the "wannabes". Sure, I have a favorite chef or two, but my admiration never approaches adulation. It's muted and controlled, and based on an honest assessment of their food that, I hope, is detached from the cult of personality that's so prevalent today. I've obviously had some disappointments and tend to be unforgiving when that happens. This is not, however, going to be an expose. I want, instead, to focus on a chef who consistently delivers - in his food, his restaurants and his books. Many of you know of my admiration for Thomas Keller. I have featured several of his recipes on One Perfect Bite, have read all of his books and eat in his restaurants whenever possible. I have not, until today, baked any of the cookies that are sold at his Bouchon Bakery. I chose the Nutter Butter cookies because I knew the Silver Fox would love them. I decide to use the recipe from the New York Times. After I had finished my baking, I found a more exact recipe for them on Culinary Trends. I plan to use that recipe, found here, the next time I make these cookies. The recipe below comes from the New York Times, but I've changed the ingredient's list to make only half a batch of the cookies. While they are quite homely in appearance, they are surprisingly light and crisp and very, very good. My only criticism is that the cookies are way too large for mere mortals to consume. Mine were saucer-size and next time I'll make them smaller. If you bake and you love cookies, you'll really enjoy these. If you are a serious baker, I urge you to visit Culinary Trends. Here's the New York Times recipe scaled to make half a batch of cookies. 2) To make cookie dough: In a bowl, mix together flour, baking powder and baking soda; set aside. Using an electric mixer, cream together butter and peanut butter. Add sugars and beat at medium speed for 3-4 minutes, scraping down bowl twice. At low speed, add egg and vanilla. Add flour mixture and stir until well mixed, frequently scraping down bowl. Add peanuts (if using) and oats, and mix well. Using an ice cream scoop 2 inches in diameter or an extremely heaping tablespoon, place balls of dough on parchment-lined baking sheets at least three inches apart. Bake until cookies have spread and turned very light golden brown, about 10-14 minutes. Remove from oven and set aside to cool and firm up, 5 to 10 minutes. Transfer to a rack to cool completely before filling. 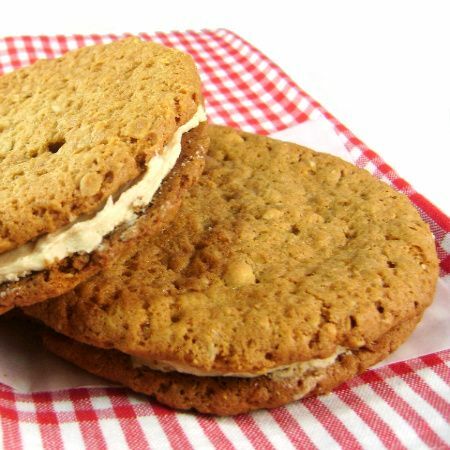 3) To make filling: Using an electric mixer, cream together butter, peanut butter and confectioners’ sugar until very smooth. 4) To assemble cookies: Spread a thin layer (about 1/8 inch) on underside of a cookie. Sandwich with another cookie. Repeat. Yield: 12 large cookies. Cook's Note: A specific peanut butter is listed in the ingredient list, both here and at Culinary Trends. Interestingly, not all peanut butters taste the same. Apparently the staff at Bouchon prefers Skippy. It is not an advertisement. Yum! The store-bought ones are tasty, but these look even better! Home-made cookies win hands down everytime in my book. These sound Yummy. Thankyou for stopping by my teacup page and for your lovely words. Yummy, so delicious! Have a nice day, hugs! Those cookies must be addictive! These cookies looks really good. Though I am not a great fan of peanut butter, but yes, Skippy is my preferred brand. Thanks for sharing. thank you for your nice message on my blog. This is just so mouth-drooling!! Am loving it!! Homemade cookies are much better than store bought ones..these looks wonderful and delicious..love the filling..so yum!Thanks for the recipe! ohh...wow my mouth is watering..just looking at this.. The cookies look terrific, of course, but I am drawn to comment on another point you have raised. The cooking shows that feature certain "celebrity chefs" and such have provided me quite a bit of entertainment. My feeling is that these shows have raised an interest in cooking in general and have been good for the craft. If I were a truly great chef, I might feel otherwise! Love your blog. And thank you for always taking time to leave a well thought out comment on mine. Blessings! They sound amazing Mary. My future son in law loves peanut butter so I will need to give them a try! you said homely? Not at all, they look fantastic, I wouldn't mind having a number of them! These biscuits sound heavenly with that creamy peanut butter. Oh, my! Have a great day Mary! I love the look of these cookies.... Did u say they are crispy? Yum! Crispy and yummy looks grt. My DSO loves peanut butter cookies the way his aunt used to make them. Unfortunately, I never got her recipe nor did anyone else. Since these are crispy, I think they'd fit the bill. They're going on my "to do" list. I LOVE nutter butter cookies. When I was a kid I could literally eat the whole package of them...ok, who am I trying to kid? I could STILL eat the whole package of them! Will definitely be trying these! These look wonderful! At first though I thought it said Bacon Bakery's Nutter Butter Cookies. Now won't those be interesting. My grandma always had a variety of cookies on hand. Especially, during the summers so we could take cookies out to the field when my grandpa and dad were haying. WOW... These look amazing beyond belief! Just look at the texture of the cookies and the creaminess of the filling! I love oat based cookies and these look great. I think I could eat a saucer sized one! I always say you can't go wrong with oatmeal in cookies and these sound and look really appetizing. Looks heavenly good! I want some! first time here, I should have come earlier. Tempting recipes.I haven't seen a tastier blog! Yum! They look so appetizing! I love nutter butter cookies and will be trying it your way! I'm glad you paid a visit to my blog. I am now a fan of yours. Such gorgeous pictures and I do love the wide range of recipes you have. Hubby said I'm not allowed to make those. They look too good! I make a pumpkin cream cookie similar to this. They make my tummy very happy, I'm sure these would do the same. Now you've got me wanting to buy some different peanut butters and compare! These look so good! Not too big for me. How about with a cup of coffee or tea for lunch! Cookie lunch! 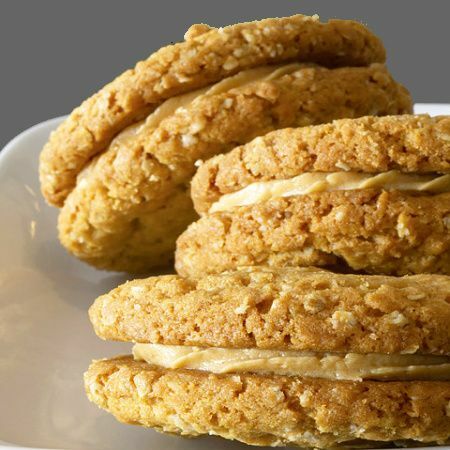 i love peanut butter cookies , both asian and western type and thanks for the link on culinary trends. I know at least one member of my family who would devour them, or may be two. They look delicious! These look so wonderful! You make the best things! I have never had a nutter-butter cookie and I cannot think of a better way to start. I own The French Lundry cookbook and have yet to cook from it - and I've had it over ten years. I will take it in hand tonight. And have noted those mammoth cookies - I don't suppose I could serve them for dinner? I know they will please. For me personally, there is no better dessert than a cookie. Peanut Butter being a favorite ingredient of mine makes me excited to try this recipe sometime. I am going to bookmark it. I’m thinking because it is a sandwich cookie, smaller would be a good idea so I’ll keep that in mind. Thanks for the inspiration! I have always loved Nutter Butters. I will have to try this out, post haste! Oh for a plate of those with a glass of milk!!! Beautiful!!! Those cookies looks so perfect and delicious! These look like the old Girls Scout cookie - Savannahs. Loved them! Thank you for scaling down the recipe. OK, is there a such thing as a cookie that's too BIG?! maybe. maybe not. I love what you're saying here as I too (while I really enjoy so many chefs...celebrity chefs included) I do not understand the (like you say) "colt following" that turns them into GOD in some peoples eyes. That's funny:) I posted some p. butter sandwich cookies today also. Yours sound wonderful! These cookies look fantastic. PB!! Cannot beat that. Thanks so much for visiting. Always glad to have guests. I love peanut butter cookies! These look wonderful... but then anything Keller makes is always perfect. I made peanut butter cookies a month or so ago... could it be time for more??? Keller's cookies are renowned for being obscenely large. I love how peanutty these are! Definitely something I need to try...maybe I'll just skip lunch and eat them as a meal! Cookies with oats + peanut butter! I will be baking these. For some reason I've never cared for peanut butter (as outrageous as that might sound) but these look like they could work well with the almond butter I use instead. Very nice, Mary! These cookies look so savory. Thanks for sharing! Nothing can compare to home made cookies. Peanut butter is my favorite and Skippy is the brand I always buy. I am going to make this for sure. Thanks for sharing your recipe. Oh, wow, Mary. I am with the Silver Fox. I know I would love these! home made cookies are always the best and yours look so great. I'd enjoy some with a cup of tea. They look delicious! I wish I could make all of your recipes! So peanut-butteresque! I love these cookies! Oh, my...these look fabulous, Mary! Thank you! I love Bouchon Bakery and live just about a mile away. I stop there whenever I can -- but not too often, so it's still a treat. Everything is wonderful. Mary, you never cease to amaze me with your recipes. My mouth is watering right now! Have a blessed day! I am wondering if I could make this with almond butter and almonds. I have an open bottle of almond butter and my husband who loves nuts, does not particularly like peanut butter. It seems to be too good a cookie, not to make it. Hmmm - these look sinful! Oh yes - and that Keller, he's amazing. Thomas Keller (and his restaurants) certainly have some great recipes. Nice looking cookies! Ice cream scoops come in so many different sizes. I find the #50 size is perfect for cookies, making 12 portions per half sheet pan (the # is engraved on the inside sweeper arm of most scoops). At any rate, I look forward to trying these cookies. Have a great week. PS - I'd love it if you stopped by to visit my new blog location.